To celebrate the return of The Great British bake off, GOCompare have created a list of the UK's most popular desserts, including Scones, Victoria sponge and many more | City A.M. The much-anticipated Great British Bake Off kicks of this evening - as we are a nation known for our love for afternoon tea, it’s no wonder the return of our favourite baking show has got us all in a frenzy. Click image to open interactive version (via Gocompare.com). . The list was collated from a combination of sources including BBC Good Food, BBC Food, and The Great British Bake Off. A baker’s dozen of cakes were shortlisted based on their cultural prominence and having sufficient popularity on Instagram in the UK. 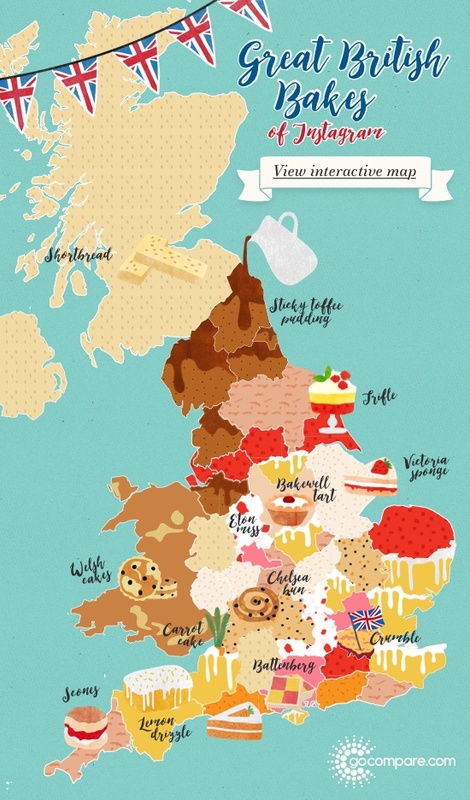 Crumble came out on top as the British favourite for the majority of regions in the UK, revealing Londoners as the lead connoisseurs, in comparison to our Eaton Mess eating and Lemon Drizzle loving neighbours in Buckinghamshire and Essex. On the top list of bakes for the UK, Scones rank at number one with 22 per cent of the country baking them on a regular basis, followed by the Victoria Sponge, with 14 per cent, and Sticky Toffee Pudding, with 12.9 percent. The Battenburg came in last at number 13 with 1.4 per cent, this distinctive cake particularly popular in Derbyshire.